We’re live! This year we’ve partnered with illustrator Tom Haugomat to bring our California landscapes to life. San Diego, LA and San Francisco, you’ll start seeing these pasted around your ‘hood real soon. Hey, look at that! Our Avocado posters just got recognized by the fine people at Graphis. This was a fun one to work on, and I still get emails from people asking me to sell them one. I don’t have any, I promise!! Here’s a little video of Michael Schwab, the artist behind these posters, talking about his process. Don’t email him for one either! 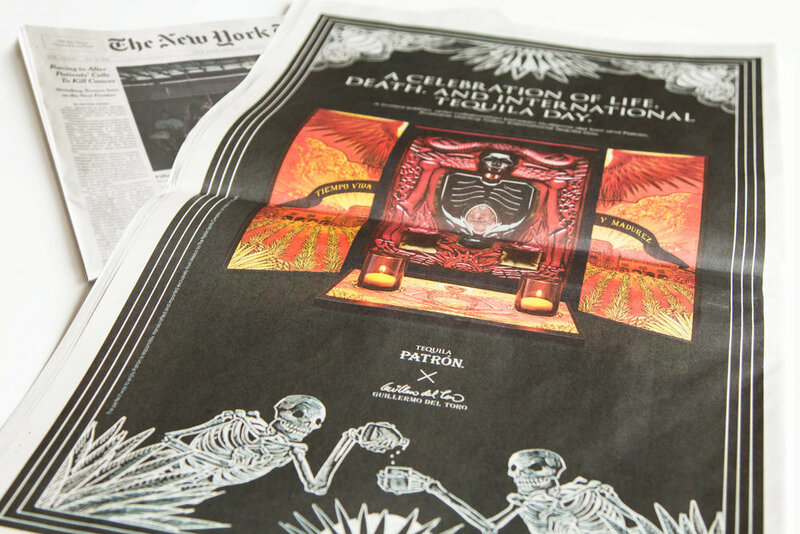 Here’s a little something we just ran in the New York Times to celebrate Patrón’s partnership with Guillermo Del Toro. A limited-edition bottle and a spooky full page ad. Adweek and Forbes just gave us some love. That feeling when you spend like 2% of a huge TV spot’s budget but still get Super Bowl press? Feelsgoodman.